So far this season, the Nuggets’ Danilo Gallinari is shooting 42 37 percent from behind the 3-point line. This is kind of impressive, although unremarkable by itself, but when we account for shooting angles, something more noteworthy is revealed. First off, Gallinari shoots 3s from all over. He’s pretty active in the corners and at the top, but he’s most active along the wings; this season, well over half of his 3-point attempts have come from the wings, where he’s gone 41-for-123 (33.3 percent). Again, this is unremarkable. However, breaking it down further reveals Gallinari is much better from the right wing than the left one. In fact, of the dozens of players with at least 50 attempts in each of these zones, Gallinari is the best from the right wing (28-for-53, 53 percent), and the worst from the left (13-for-70, 19 percent). The two most fundamental components of spatial analytics are distance and direction, but too often we neglect the import of direction in even our most “advanced” NBA metrics. The case of Gallinari reminds us why that is limiting. By lumping all of his 3-point attempts into one convenient distance-based bin obscures a key bit of information about his game. Anyway, since we looked at the best shooters around the court space yesterday, it makes sense to look at the bad news today. And, while Gallinari does appear on this chart, he doesn’t deserve to be the focal point of a discussion about inefficient NBA shooting. 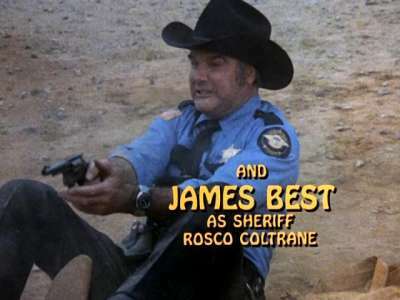 Instead, I will devote that to the player who blends incredible talent and fan infuriation like no other; the guy who deservedly comes up every time we talk about players who are really active outside of their proper jurisdictions, that crazy sheriff down in Georgia — no, not this fella. As we pointed out yesterday, as of January 22, the NBA had made 44.7 percent of its 100,607 shots. You don’t have to look hard to find players whose individual shooting performance mimics this same efficiency level. For example, Atlanta’s Josh Smith has made 44.8 percent of his shots this season. Through that lens, Smith appears to be a normal NBA player, but Smith is far from normal. He has a game that drives people crazy. You might think that Smith arrives at his “average” field goal percentage in a conventional way, but nope, that would be too logical. Instead, Smith arrives at his forgettable overall shooting efficiency by being very efficient near the basket and the worst volume shooter in the NBA away from the basket. Ten steps forward, 10 steps back. So far this season, Smith has made more than 62 percent of his shots close to the basket, which is a value significantly higher than the NBA average. It’s also higher than Tim Duncan’s 60 percent and Dwight Howard’s 61 percent. This is especially impressive considering this is the most ferociously defended real estate on the floor, where monstrous athletes like Larry Sanders (also known as LARRY SANDERS!) and Howard try really hard to prevent shots from going in. Still, in terms of both volume and efficiency, Smith unquestionably performs at an elite level down there. He’s a great interior scorer. Unfortunately for Hawks fans — and for fans of general alignment of talents and actions — Smith has a destructive jump shooting habit. While it would be unfair to label him the worst jump shooter in the NBA, it is probably fair to claim that he is the worst active jump shooter in the league. Most guys — Tyson Chandler, for example — who can’t shoot 17-footers don’t make a habit of trying anyway. Smith does. As a general rule, Smith shoots almost exactly half of his shots within 7.5 feet of the rim, and the other half outside of that threshold. As of January 22, Smith was 80-for-297 (27 percent) outside of 7.5 feet, and 178-for-287 (62 percent) inside that distance. He spends too much time doing stuff he’s not good at. The notion that Smith has more midrange attempts than Al Horford and Lou Williams is simply ridiculous. While the case of Danilo Gallinari gently reminds us that direction is a vital component of shooting analytics, Josh Smith’s situation punches us in the face and screams about the importance of distance in offensive evaluations. How bad is Smith’s jump shooting? When we divide the court space into 10 sectors and evaluate shooting efficiencies in each, Smith turns out to be the worst in two adjacent zones. [Click for a larger version. ]There it is; Smith has managed to underperform all qualifying NBA players in two neighboring spots along that midrange area on the right side of the court (graphic left). Smith’s atrociousness is at least consistent across these two zones. Why is he active there? Sometimes I wonder about Smith on other teams; would he shoot there if he were on the Spurs or the Rockets? One thing’s for sure; if he goes to the Lakers he’ll shoot more there (Gasol et al. 2013). But seriously, the saddest part is if Smith developed a post game or just simply removed these shots from his arsenal, we could have another superstar in our league. 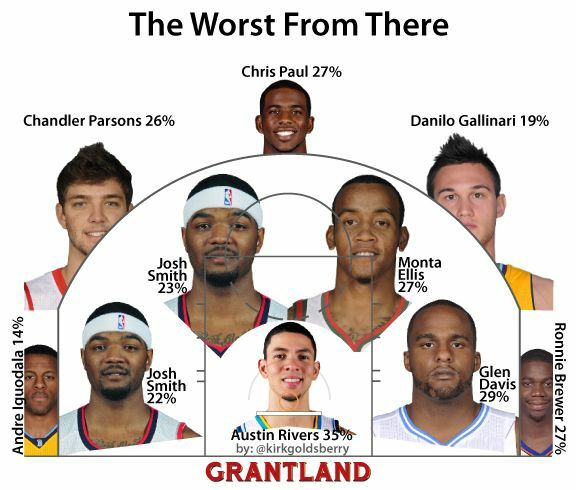 Aside from Gallinari and Smith, the graphic also reveals that Austin Rivers is having a tough time finishing close to the rim. In a zone where the league makes more than half its shots, Rivers is making only 35 percent of his. This is not unusual for a young guard trying to get used to the NBA. Last season, Ricky Rubio was dead last in this zone at 41 percent. Regardless, it provides a little more evidence of Rivers’s early struggles. He’s also been below average in almost every other area of the court. Glen Davis’s appearance on the chart provides a reminder of the Bass-Davis trade a few years back. When the Celtics made this trade, they knew they were exchanging one of the worst midrange shooting forwards in the league for one of the best. In an offense that relies so heavily on midrange catch-and-shoot opportunities, Davis’s inability to make these shots stuck out. Although Celtics fans will be quick to point out many Brandon Bass shortcomings, none should argue that his midrange shooting is one of them: In a down year, Bass is still making 44 percent of his midrange shots. Though we’re only halfway through the season and some of these samples are smallish, every player on this chart is both active and inefficient from their problem zones. I predict that when we rerun this analysis at the end of the season, some of the faces will certainly change. I bet Chris Paul and Chandler Parsons will shoot their way off this chart. I hope Andre Iguodala stops shooting from the corners and fails to meet the minimum attempt threshold; he’s not Matt Bonner. Most of all, I hope Josh Smith will also be replaced, but unfortunately I’m pretty confident he’s not going anywhere.